The Goodwin street entrance of the Krannert Center. Krannert will be hosting a commemorative concert in honor of Project 500 and the alumni who were apart of it. To honor the legacy and alumni of the Special Educational Opportunity Program, or Project 500, the Krannert Center for the Performing Arts will host a commemorative concert at 7:30 p.m. Friday. Established in 1968, Project 500 was the University’s first effort to offer equal educational opportunities to Illinois residents regardless of race. At the beginning of the 1968 school year, 565 newly admitted African-American and Latino students entered the University under the project. 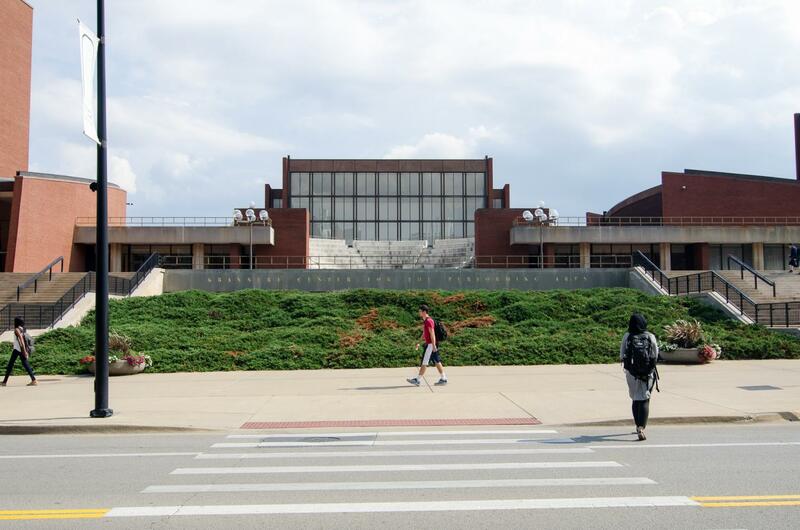 Samuel Smith, director of civic engagement and social practice for Krannert, said the concert will recognize the historical significance of Project 500 and the struggles and development that have gone into preserving the right to education at the University. The concert will commemorate the 50th anniversary of a student-led protest that took place at the Illini Union on Sept. 10, 1968. The protest, which led to the arrest of 240 black students, resulted from miscommunication between students and the bureaucracy. The concert will include performances by the UI Black Chorus, professor Endalyn Taylor and choreographed performances by professors Lisa Gaye Dixon and Dr. Kemal Nance. Smith said students attending the event will have the opportunity to interact with alumni and learn first-hand about their legacies and hopes for the future.